So two things that I absolutely love are animals and books, in reality, who doesn't. I have been thinking for a while of doing some kind of feature with them both however I am not great with creativity. Blogger is grand and really user friendly but trying to incorporate a feature that people can add their own photos too hasn't been easy. If you can think of any suggestions please let me know, I was considering a tab of their own and some kind of linky to take you back to your page but think I would need more of a meme style thing maybe with questions. That however would mean bloggers would need to make an actual post like this in order to link back. Isn't she beautiful, if you have been to the blog before this face needs no introduction, if you are a new visitor then introducing you to Princess Trixie (used to just be Trixie but she got upgraded to match her Diva attitude). This is her with The Watcher by Ross Armstrong, read my review here. And here she is with Rattle by Fiona Cummins, review here. So until I can accommodate something here I have set up a photo album on So Many Books, So Little Time. You can upload your photo to the album and share your beautiful babies and books. Some people have reporting issues with the FB link, try this one *CLICK HERE* it takes you direct to the page and you just need to click on photos and find the album that way. 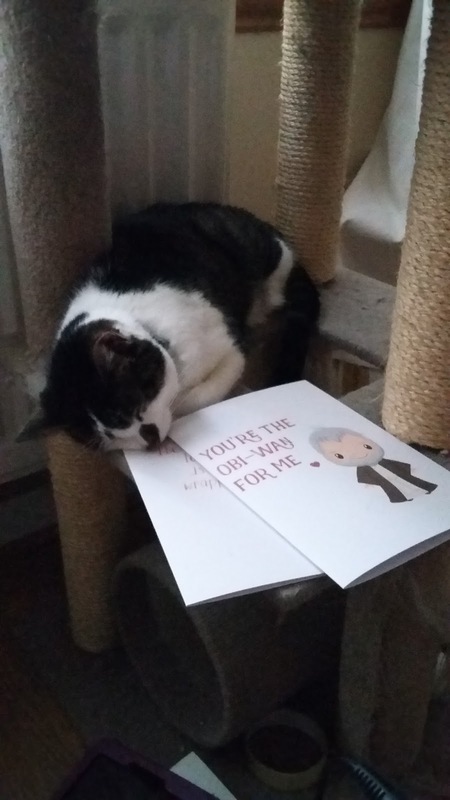 If you do not have Facebook and wish to participate please tag me @smbslt on Twitter, use the #PawsandPages or email your piccy to alwaysreadingsmbslt and I can upload it for you. Let me know your blog url and or blog name and I will add that to the post. If you are an author I think this is a cute way of advertising your book, a picture of your book baby and fur baby (or scales or whatever kind of pet you have). Get involved guys, you can tag on Instagram too. Any other suggestions let me know the usual routes, here, insta, facebook, twitter or email. The second book in the Sean Denton series. A young woman is trying to rebuild her life after prison, but someone is out there who won't let her forget what she's done. Racial tension is bubbling up on the Chasebridge Estate and Sean is drawn back into a web of family and neighbours he'd rather avoid. 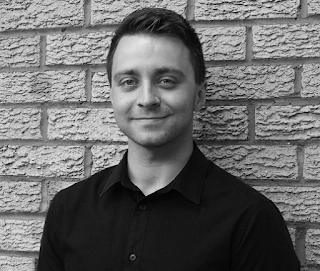 When a body is found in the stairwell of a block of flats, Sean is right at the heart of the case. February hasn't been the most active with posts on here as you may have noticed if you are a regular visitor to the blog, I also have only read 5 books this month which, for me, isn't a lot considering I had some time off. Well there has been lots going on and most recently has been with Princess Trixie (the adorable kitty that features on here). 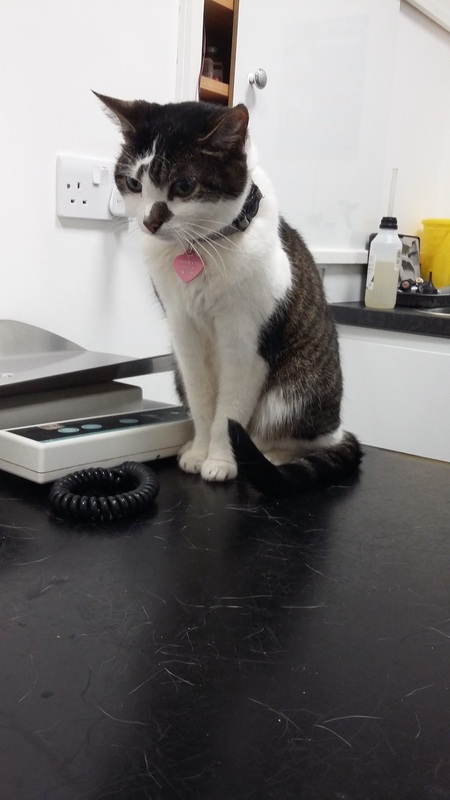 We took her in for her check up, she is 16 has stage 3 kidney failure and every day we get is one more than we expected but she had been grand. It wasn't great news, her health had deteriorated, her weight dropped 7%, her eyesight was going, arthritis is getting worse and starting in her front legs. We left and it was pretty emotional however she got some strong painkillers which seen her rally the last time & they took some bloods. 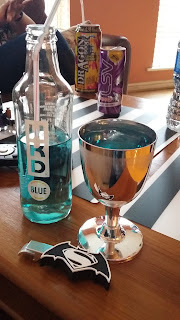 We got a phone call from the vet on Saturday to say all bloods were much better than expected, we were going out to celebrate a friends big birthday so it turned into a double celebration. 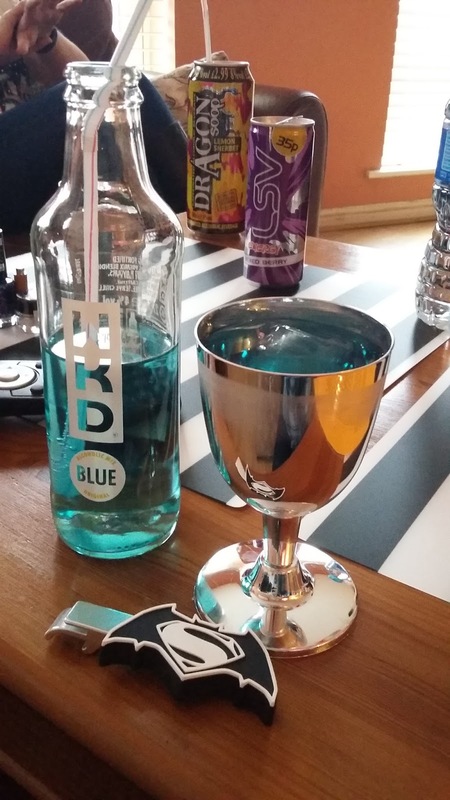 And what better way to celebrate than with my fav drink and a wee goblet with a super cool nerdy bottle opener. 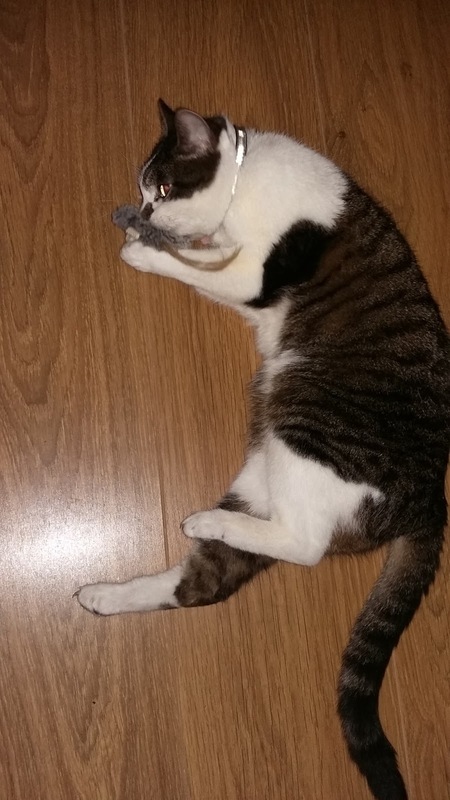 One night after her painkillers and we had a very playful kitty, if you follow us on Instagram (Always_reading) you can see a wee video of her! 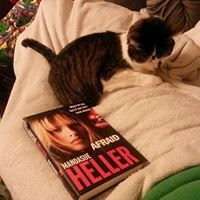 So now that we have our blog mascot fighting fit for another day, I am considering trying a new feature as I don't know about you but I LOVE seeing peoples furbabies and books so watching this space. 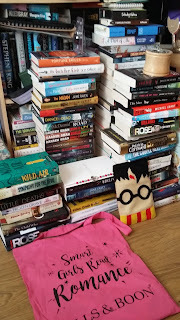 Now I can concentrate on reading I can get stuck into the ever growing TBR list and I have some time off coming up which is just as well with all the incoming reviews. 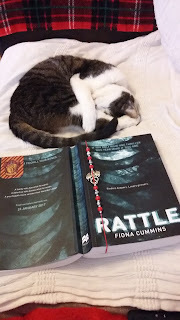 Today will be catching up on my reviews, I have already posted my thoughts on Rattle, the new debut by Fiona Cummins and hoping to get another few up and finish my current read. 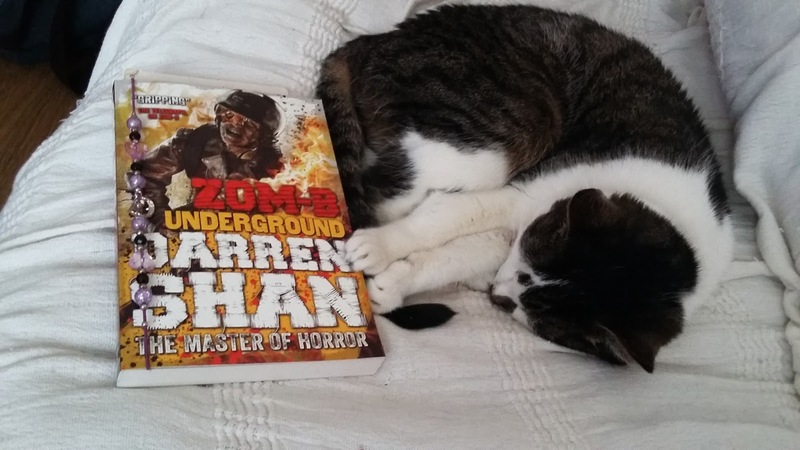 I wanted something a bit different and it has been a while since I added to my zombie reads so today is Underground from the ZomB series by Darren Shan. 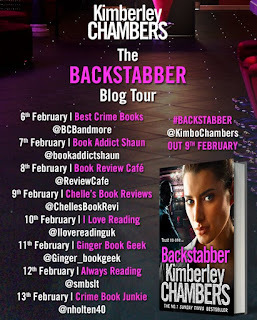 Today is my turn on the blog tour for the new novel Backstabber by Kimberley Chambers. Firstly, apologies my post has gone up so very late in the day, I had tried the schedule post option for the first time ever and it hadn't loaded. Scheduled as I had a busy day and have just got home so quite annoyed but just one of those things so apologies again. You can read my review for this book HERE. 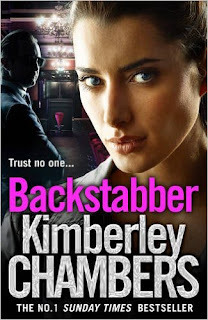 If you haven't read the Butler/Mitchell books you NEED to before you buy this one, you will have missed so much back story and they are fabulous so buy and read them first. Backstabber is out to buy now, print and ebooks from all good retailers, from Amazon click here. Please note Always Reading is my spot, my url is always reading the actual blog name is So Many Books, So Little Time lol this happens a lot! 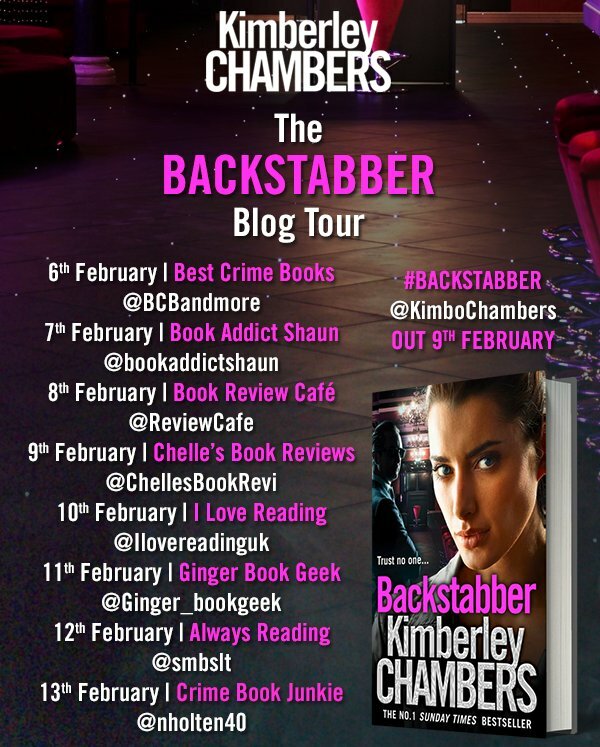 Make sure you check out the other blog stops for this tour & be sure to leave a review on all the usual places when you finish it, authors love that. Maisie Bean is a fighter. A survivor. Seventeen years ago, she went on a first date that went so badly it was enough to put the girl off chips. The marriage that followed was hell but it gave her two children: funny, caring Jeremy and bullish but brilliant Valerie. Just as it seems everything might finally start going right, sixteen-year-old Jeremy goes missing. The police descend and a media storm swirls, over five days of searching that hurtle towards an inevitable, terrible conclusion. Maisie is facing another fight, and this time it’s the fight of her life. But she’s a survivor. Whatever the odds, she’ll never give in. 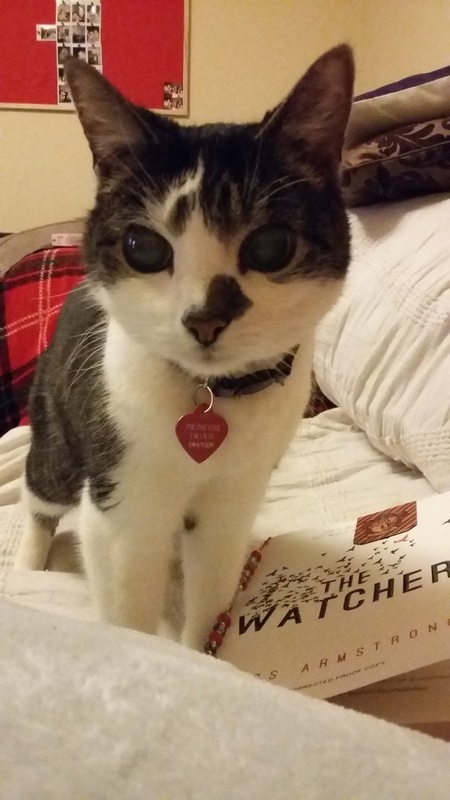 The book opens in present day, Maisie Bean is about to do a talk and she is feeling nervous. She takes the reader back to the past that shows us how she got to where she is and why she does what she does. She has two beautiful kids who have their own issues after watching their mother survive and abusive relationship. They live with Maisie and her mum whose illness provides more stress and strain on the family. Her youngest is moody, argumentative and trying to find herself and Jeremy is the apple of everyone eye, sixteen but responsible, kind, caring and trustworthy. This is what sends everyone into a panic when he doesn't come home, the media get involved and things from the past won't stay buried. McPartlin has a style where she can hit some very dark and unsettling topics but still infuse the story with humour and provide light relief which I think is an amazing feat for an artist. The characters you immediately warm to, or hate pending on which ones we are talking about. She whirs up a storm and covers many issues in life that the reader can identify with or at least one of them. Friendship, love, domestic abuse, sexuality, homophobia, media scrutiny, personal growth, family secrets, the list goes on and on whilst not overstretching the story or realism. I could have easily read this in one sitting had time permitted, you are drawn in within the first few chapters and I gasped out loud at least once. 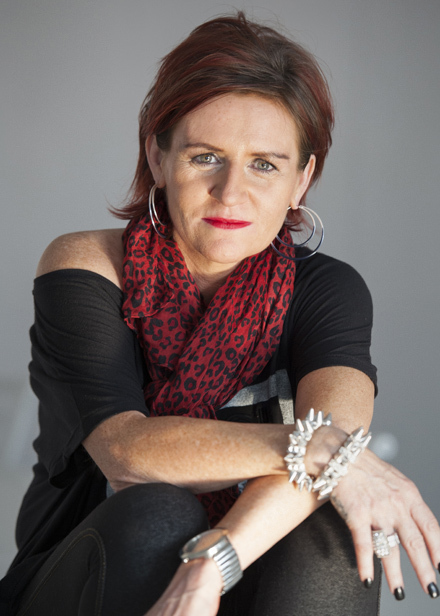 A very talented writer, I have read her before and I will read her again, I think her writing gains strength with age and experience, 4/5 for me this time. 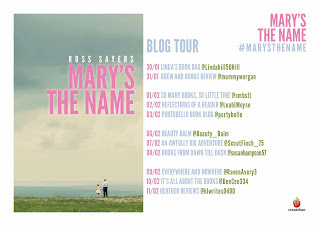 Welcoming Ross Sayers to So Many Books, So Little Time and today is my turn on the blog tour, apologises the post isn't as early as I had hoped, we ran into some internet gremlins but we are cooking with gas now. You can find my review for this lovely wee book HERE. 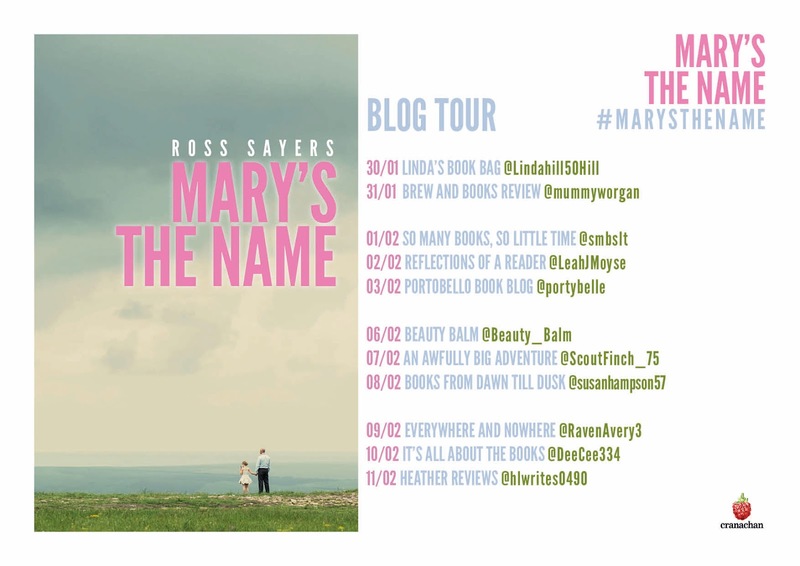 Ross very kindly took some time out to answer some questions about his new debut novel, Mary's The Name. What made you pick Mary specifically as the protagonist, her age, being a girl etc? I had been experimenting a lot with child narrators, working out what makes them believable. I wrote a lot of stories about young boys, so to get out my comfort zone, I chose a girl for the story I had in my mind at the time. Turned out the story had legs! I was quite nervous to show my early drafts to female readers, but thankfully, I seem to have picked a winner in Mary. Making her eight years old is helpful from a story point of view; she understands a good amount but isn’t quite clever enough to work out what’s really happening in some situations. The more Scottish stories the better! They say write what you know, so I started the book in my hometown of Stirling. When it came to finding a more remote location for the rest of the book, I knew I wanted one of the islands. It really was a bit of a random pick, but I loved visiting Portree and hope to get back very soon. It was very well constructed, is this the first novel you have written? That’s very kind, thank you! It is indeed. I have a story structure I like to use, to ensure the story is complete and satisfying. However, if an idea comes to me which disrupts the structure a little bit, I’m happy to go off-track and wing it! Tinder, we have to talk about that, what made you come up with that idea? So, having used Tinder before, I knew just how many people are on it, and how easily you can have your profile pop up on their phone. I hadn’t heard of anyone doing it before, so I set up my profile as the book’s cover, as well as a bio about how I would only talk about Mary’s the Name if I matched with them! Most girls thought it was funny and I had lots of fun chatting to them. I was a bit embarrassed, to be fair, but knowing I would get a good story and blog post out of it made it easier. There was a great reaction online, thankfully! What is next for Ross? I’m currently planning out novel number two! It’s looking likely it’ll be set around where I live, more specifically in the Bannockburn area of Stirling. It’ll feature some high school pupils getting into trouble with the law when they should be in class! I don’t know if I have a definite number one? It’s too hard to choose! But given how much I love humour in books, I’ll give a special mention to two which made me genuinely laugh out loud: Catch-22 by Joseph Heller, and True Grit by Charles Portis. The Trouble with Goats and Sheep by Joanna Cannon. I’m really enjoying it so far, and the little girls in the story remind me of Mary! Where can fans contact you? You can find me on Twitter (@Sayers33), Instagram (Sayers33), and I have a Facebook author page too. There’s also rosssayers.co.uk, where I blog about my experiences as a writer, and you can find the Tinder blog there! And if all of this wasn't enough for you lucky lucky people, I have one paperback copy to giveaway, as always use the Rafflecopter below to enter.